The standard refurbished LaserJet 5500dn includes one 500-sheet paper cassette, a bypass tray, and a JetDirect card for connecting to a network. It also includes a built-in duplexer for double-sided printing. Additional tray options are available above. This is an excellent printer for medium to high volume color printing.It is a standard workhorse in offices all over the world. Compared to HP's latest line of color LaserJets, a refurbished 5500dn can save you a bundle in printing costs! Check out toner cost comparisons below -- you'll be surprised at the savings! 11"X17" printing. Very few Color laser printers have the capacity to print these large-format pages. Most that do are either (a) very expensive or (b) do not have the reputation of being a "workhorse". Toner cartridges for this model are large capacity, 13,000 page yield at 5% coverage. Smaller color LaserJets only print 2,000-4,000 pages per cartridge, resulting in a higher cost per page. 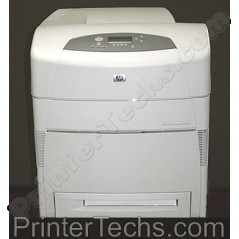 LaserJet 5500 remanufactured toners are readily available and reasonably priced. Toner cartridges for new printers tend to be ridiculously expensive. See below for a cost analysis. We rebuild the fuser and install genuine HP rollers and separation pads. These are more expensive but you get improved performance compared to cheap aftermarket parts. We include a used transfer kit with the purchase. Life expectancy is unknown for the starter transfer kit. We would rather include one with the printer than recycle it before the end of its life expectancy. We recommend buying a new transfer kit for backup. If you have any questions, please give us a call. 866-352-7108. This is a large printer: with multiple paper trays installed, the printer weighs in at over 250lbs. Because of the size of the printer, it is safest to ship on a pallet via freight. Call us if you have shipping questions. We also sell parts and consumables (like toner cartridges, maintenance kits, fusers and transfer kits) for this printer. Let us know if there is anything you are looking for. Important Shipping Note: Because of its weight & size, this printer ships on a pallet via freight truck. Our Web site will make a rough shipping estimate; this estimate assumes you have a loading dock or forklift available for truck delivery. Before shipping the printer, we will call you to verify the shipping details of your order.